One Touch – Multifunctional Metro Stylish Theme. We present you our look as sites in MetroUI style have to look. The fast, easy, light template will decorate almost any site on WordPress. The structure of this template such is what it perfectly will be suitable for all, from the entertaining blog to a serious corporate site. Styles are included in a template for WooCommerce so you will be able to create without problems the catalog with shop on your site. Many Shortcodes, Page Templates and Theme Options give you full control over your website. Manage your site like never before by using the countless powerful features that come packaged with all of our themes. We providing good tech support to all of our customers. With our dedicated support staff, you can be sure that you will have your blog up and running without a hitch no matter what your experience level. The most famous feature of the Metro Interface is the tile (color square width text or (and) icon). We included tile generator into our theme. Using it, you can add tile into the page, using simple editor. One Touch theme Tile generator allows you to edit text, numbers, you can select tile templates, insert icons, configure background. Create your tiles in few seconds, and have original site. Our theme options panel comes with all of our themes, allowing you to easily control your website without ever touching a line of code. Additional features allow you to toggle on and off features, adjust your layout, control colors and more! Panel allows you to quickly change various parts of your theme, such as font and background colors. It has never been so easy to edit layout of your pages. You can create any number of blocks, customize them, load content from any page or templates. Using simple Drag and Drop interface you can add and remove any blocks in any order. In our theme, your pages layouts limited only by your imagination. Together with a subject we suggest you to use two remarkable plug-ins of “Slider revoltion” and “Visual Composer”. Template with Modern UI inspires confidence and motivated towards detail. It creates and gives a feeling of reliability and safety. This new minimalistic approach might just be the future of the web. We all assume tablets and touch, portable devices are the future of your new site. Correct site on any device! Your users see the same site on all devices. It doesn’t matter if they use desktops, tablets or smartphones, your visitors will enjoy the same remarkable experience. All the elements scale and resize depending on the device the website is viewed on. No more words! Just try it! 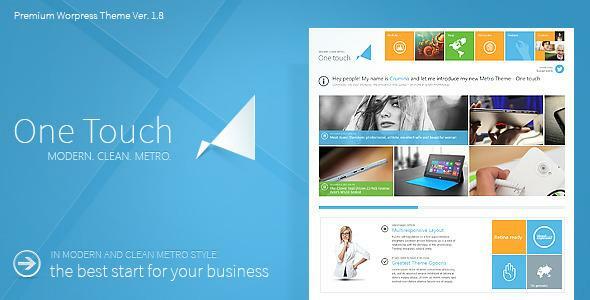 Share the post "One Touch – Multifunctional Metro Stylish Theme"